Poor litter box maintenance is often to blame for a cat's mishaps. Cats hate dirty litter boxes and may be driven to search for substitutes, whether that's a corner of the carpet or a basket of clean laundry in the closet. Your cat's sense of smell is 14 times stronger than yours, so a litter box that smells reasonably clean to you may outright stink to your cat. While automated litter boxes are gaining popularity, their prices are prohibitive to many cat owners. 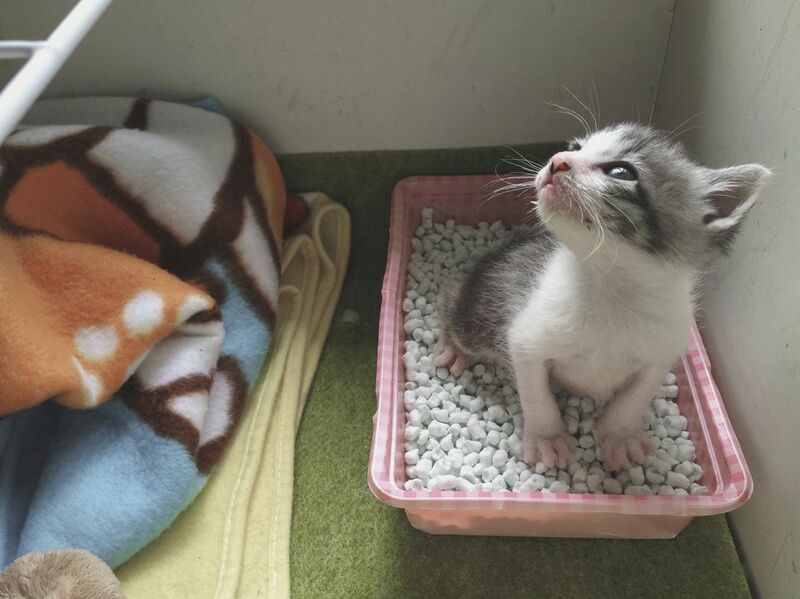 Most cats tend to prefer standard litter boxes. The rule of thumb is that a household should provide one litter box for each cat resident plus one extra. Any variance should be on the plus side. For example, seven boxes for four cats. If you have more than three litter boxes, you'll probably find yourself running out of logical places for them. A "Litter Station" with two or three boxes side-by-side will accommodate more than one cat at a time (as long as the cats tolerate it), and will also make scooping and clean up a bit more convenient. Which litter box and cleaning products to use are very personal choices, and the "one size fits all" rule rarely applies. Most important is to let your cat(s) be the guide. If they are not happy with your litter boxes and accessory products, they'll let you know. Unless your cat has a preference for covered boxes or the box is in an area where you'd like to keep it inconspicuous, such as the kitchen, the best box to start with is a plain rectangular one. Make sure the box is large enough that your cat can move around in it comfortably, with no overhang. The box should be placed for maximum privacy, away from noisy appliances, and with an easy escape route, in case you have a cat who likes to bully other cats. Being trapped in his litter box will surely frighten the cat, and may lead him to avoid the box later. The use of litter box liners is optional. They are convenient for tidy disposal of the used litter when it is time to empty and wash the box. Liners are a definite advantage when using non-scooping litter because they contain the excess urine that seems to pool, which is the reason most non-scooping litter must be changed frequently. Most cat litter manufacturers recommend using 2 to 3 inches of litter. You may want to use 3 to 4 inches if your cats are deep scratchers who will dig all the way to the bottom of the litter box if you use less. Start with 2 inches and experiment until you find the ideal depth for your cat. World's Best Cat Litter is a good choice. It is a clumping litter, so you don't need a pan liner. After filling the litter box, give the litter a final leveling off so the cats have a nice, smooth surface to dig in. With clumping litter, scooping is easy because urine clumps into fairly solid chunks which can be scooped out while sifting the clean litter back into the box. Poop gets coated with the litter so that it doesn't stick to the scoop. The litter box should be scooped a minimum of twice daily, more often if needed. You may need to add fresh litter after scooping to replace the amount that was lost. With the ​Litter Genie, scooping as well as disposal of litter is much easier. You just insert the roll of plastic bagging material inside the Genie, tie a knot at the end of it, secure it to a wheel, and turn the handle a half turn. Then open the top and drop in all the scoopings. Turn the handle again, and the waste is safely hidden at the bottom of the Litter Locker. On garbage day, just remove the bag and contents and discard in the garbage can. It's a pretty neat litter box accessory, and it really does keep all the odors confined inside. Using clumping litter that you regularly scoop and replace will keep the litter box smelling fresh and clean for a while, but at some point, the box itself will need to be emptied and cleaned thoroughly. Depending on the type of litter you use, this may be as often as every week or as long as every four or five weeks. Non-clumping litter must be emptied and washed much more often, primarily because the urine collects at the bottom of the box, and the odor becomes very strong very quickly. Empty the used litter into a sturdy plastic bag and tie securely before discarding it in the trash. Note that although some natural litters are flushable, the entire contents of a litter box should never be dumped into the toilet. Next, wash the box thoroughly with detergent and hot water. Rinse completely, then spray inside and out with a mild bleach solution, about 1 cup bleach to 1 gallon of water. If it's sunny, let the box dry outside for an hour. Rinse again thoroughly, then dry with paper towels.